Reducing your carbon footprint is something that is essential in the modern world and not something that Great West Chrysler takes lightly. Which is why we are happy to proudly display this vehicle on our lot and in our showroom. It’s got innovative technology, unforgettable styling, and power that makes this one of the most capable minivans on the market. It’s simply one of the best family style vehicles you’ll find driving on Edmonton roads later this year. Let’s take a closer look, here at your west Edmonton Chrysler, Jeep, Dodge, and Ram dealer. 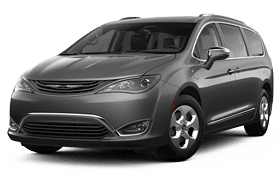 On the surface, it seems like the 2019 Chrysler Pacifica Hybrid is a vehicle designed with efficiency in mind. While that is true, it doesn’t sacrifice comfort or aesthetics in its quest for fuel efficiency. Looks-wise, it’s much sleeker and sportier than your typical van, with an aggressively sloped front grille, while also offering a wider stance led by a tough back end. Inside, you get all the perks of your typical 2019 Pacifica. Chrysler vehicles are always some of the most connective vehicles available, with the use of the UConnect system in combination with complete access to Bluetooth connectivity with your smartphone. It comes with award-winning 7-passenger seating, with the Stow ‘N Go option for easy in and out access. It’s a supremely comfortable ride! One of Chrysler’s best-kept secrets is the fact that their minivans are incredibly powerful. While they may not look it, what’s embedded underneath the hood of the Pacifica is nothing to scoff at. This little-known fact holds true when talking about the Pacifica Hybrid. It revs up 248 horsepower and 230 ft-lbs of torque out of an Atkinsons-cycle DOHC 24-valve V6 engine with two front electric motors that bring the combined horsepower closer to 260. With this much power, it’s hard to believe that the Pacifica Hybrid can have one of the most impressive fuel economies in its class. The electric engines provide 911 km total driving range on a full charge. It’s the type of vehicle that will get you where you are going, wherever that may be, while only reducing your carbon footprint. The Chrysler Pacifica Hybrid is a new face to the family vehicle class. Since its introduction only two years ago, Chrysler has exceeded expectations with its hybrid minivan, thanks to its knack for producing vehicles that feel smarter than others. 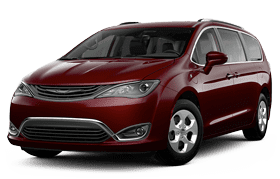 The 2019 Pacifica Hybrid is nothing if not a highly intelligent vehicle. Backed by some of the most comprehensive and connective technologies, the Pacifica Hybrid allows you to stay in touch with all of your social media while also keeping your eyes and mind on the road. Uconnect acts as the central hub for the Pacifica, with the ability to access your playlist from your touchscreen, as well as a variety of other phone-based apps, including navigation. The 2019 Pacifica Hybrid will ensure that your journey will be one taken in both style and comfort.